The giant Madagascar day gecko is bright green in color with some reddish-brown blotches on their dorsal area and head. When an animal is under stress, its body color darkens. They are active by day and rest by night living in tree canopies. Mature adults have calcium deposits stored in sacs on each side of their necks. Their toes have special adaptations which allows them to adhere to a variety of surfaces. Males are highly territorial. Breeding usually occurs from November to May. They have been observed to shake their heads and tails during breeding season which could be a form of courtship behavior. They are also known to produce calls to attract females. Females lay a pair of eggs several times a year. Conservation: Since they are widely distributed and have a large free ranging population in the wild, it has been suggested that their current status is unlikely to become threatened or endangered. 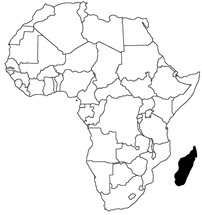 Giant day geckos are endemic to Madagascar, the island in black to the right of Africa.